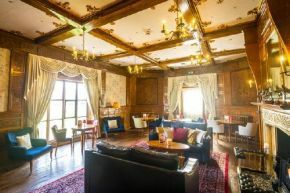 Leasowe Castle is bringing a true taste of British decadence to the castle following the opening of its recently refurbished Star Chamber. The 16th century Wirral venue has become an official supplier of Noveltea, which is famous for its variety of quintessentially English flavours such as Earl Grey Tea with British Gin and exotic blends such as Green Tea and Rum. A firm favourite in the UK’s most prestigious stores including Harrods, the alcohol-infused tea blends will be served within the Star Chamber as part of the Castle’s Afternoon Tea offering. General Manager Mike Dewey said: “Tea is part of our British heritage and dates back to the 17th century when it was popularised in England by King Charles II, making the concept of tea almost as historic as Leasowe Castle itself. Our Afternoon Tea offering celebrates a classic British tradition and the addition of the luxurious, alcohol infused Noveltea adds a truly unique twist which is perfectly fitting for our newly renovated Star Chamber which combines traditional features in line with the Castle’s heritage whilst boasting a contemporary feel. Nestled on the idyllic Wirral Coastline, Leasowe Castle is historic grade II listed hotel that has undergone an impressive a £3-million-pound refurbishment to give the property a new lease of life, whilst restoring and enhancing its original charm and heritage. Mike added: “Perfect for celebrating a special occasion, Noveltea combines the comfort of a classic cup of tea with a kick, with a range of flavours for everyone to enjoy. We are sure that it will be everyone’s ‘cup of tea’ this year!"